Grilling outdoors with a propane grill is pretty popular. It’s relatively easy, there’s very little clean up and there’s just something about grilling a hamburger outdoors which makes it taste better. When the weather starts getting better here in the Midwest, more and more grills come out from under their winter storage tarps. It’s a sure sign of spring and good weather to come, but it can also mean an increased risk of home fires. 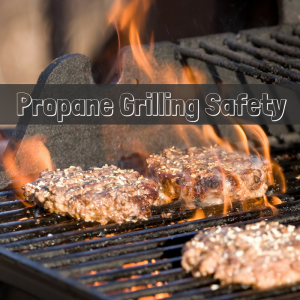 Even though gas grills are easy to use, the handling of propane tanks and propane grills should be done with care. We’ve heard the stories and in our line of business, we’ve seen the results first-hand of what can happen when people disregard grilling safety practices. Don’t place your grill under a carport or under any type of overhang. Keep your grill away from trees, tree branches and deck railings. Keep your children and your pets away from the grill. Never leave your propane tank in your garage or in a confined area like the trunk of your car. You may already know and follow all of the above precautionary tips but do you know what to do if you start to smell gas while you’re grilling? The first step is to turn off the propane gas tank and then the burners. You’ll want to pay attention to see if the leak has stopped. If it has, get your grill professionally serviced before using it again. If you still smell gas even after turning off your tank and your burners, call the fire department immediately. Don’t attempt to move the grill.